Fig & Olive had been suggested to me many times and I finally made it over to the meatpacking district location. One of three NYC locations (there is a lexington avenue and 52nd street location), Executive chef Pascal Lorange presents us with a eclectic Mediterranean menu. 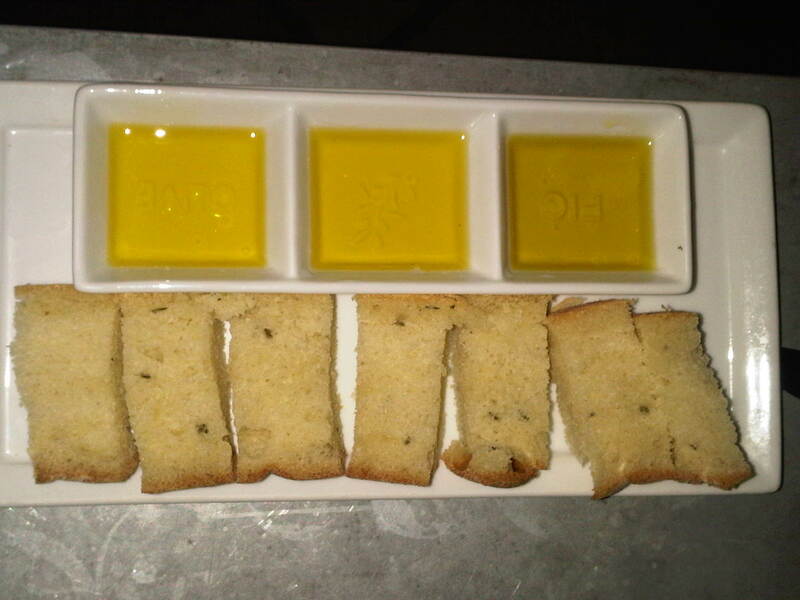 The main focus of course is olive oil, as dishes are often paired with a certain selected extra virgin olive oil. This venue is asthetically very pleasing and open with a nice big bar. Though I did have high expectations for the Fig & Olive experience, I'm sorry to say that on this occasion, especially from a culinary perspective, I was completely let down. I started with their signature dirty martini ($16) served with a choice of housemade brines verdial thyme, arbequina, olive niscoise. I went with the verdial thyme. It was an attempt to do something different that didn't quite work. The thyme and lemony flavor from the olive brine or olive juice, made my dirty martini taste more like a salad. I would have preferred just a traditional dirty martini to this. Lemon just does not factor into a dirty martini. 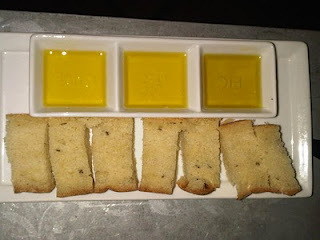 We were presented with a trio of flavored dipping olive oils and fresh bread. It was straight forward and a nice way to begin our meal. First we started with a selection of crostini (3/ $9.50 or 6/$18). 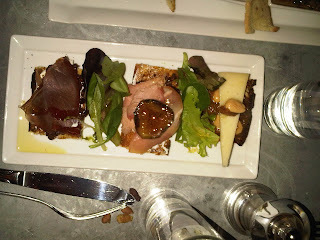 We went with the proscuttio fig olive and walnut, manchego fig spread and almond, bresaola goat cheese and black olive. It was ok, the presentation was nice. I just found the crostini to be quite chewy like they didn't keep the bread safe from humidity. I did, however, like the flavor combinations. It was a nice dish to share with friends but nothing to write home about. 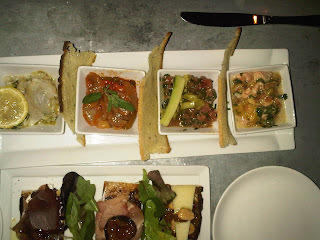 Then for the cerviche and tartar ($6 each or 4/$18). There was a salmon cerviche, branzino lemon cerviche, sesame tuna tartar and shrimp cerviche. The sesame tuna tartar was excellent! The branzino and salmon cerviche was just ok. Not bad but not great. It just didn't taste very fresh and the branzino was cut way too thick! The shrimp cerviche was rancid in flavor and smell to the point that my dinner guest and I had to refrain from eating it entirely. The manager was nice enough to bring us a second serving of the tuna tartar in place of the shrimp. A bad dining experience food wise can always be kind of deflected if the service is good, which it was on this occasion. Then for the penne funghi tartufo ($17, you can add chicken for an additional $5) served with cremini mushroom, parmesean, black truffle paste, fresh parsely, scallion and white truffle oil. I was kind of depressed at this point an didn't even bother taking a picture of this dish. It was very bland in flavor and unfortunately extremely dry as well. It was literally a plate of dry penne pasta with mushrooms that held a slight flavor of white truffles from the truffle oil. It was very disappointing. 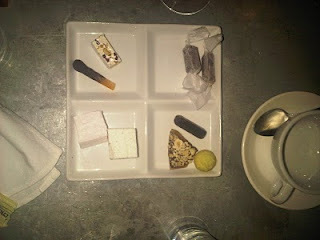 For dessert we went with their signature cookie plate ($9) that ended up being more like a confectionery plate. Frankly disaster isn't even a strong enough word to describe this dish. It had homemade paper wrapped carmels that we couldn't even get off the paper. Basically they were 100% unedible and we gave up trying. There were chocolate covered lemon peels, marshmellows and toffee. It was just weird and not what we expected. I felt like this whole meal was literally just a waste of calories. This dish should be taken off the menu entirely! I have heard people say great things about Fig & Olive in the past, I just did not have a good experience. Maybe we just ordered the wrong things or caught them on an off night or went to the wrong location. I guess in the end there are no excuses.